The property stretches over 65ha (160 acres) covering vineyards and orchards in AOP “Costieres de Nimes”. The soil is composed of alluvial stones from the quaternary period deposited by the Rhone and named “galets”. This terroir is typical to the southern part of the Rhone Valley Vineyards. Francois Collard, owner, manages the family property with his wife Anne. Agricultural Engineer and Oenologist he promotes the local varieties of grapes in the harmony with the diversity of the soil. The resulting wines display fruitiness, freshness, elegance and concentration. Here, the sun shines all year long, ensuring that the grapes reach optimum maturity. In other words, “Sine Sole Nihil” (Nothing without sunshine) is the symbol of the maturity and the harmony of the wines. On the plateau of Beaucaire, the vineyards benefit from both Northern and Southern exposure. The Rhone River is situated a few miles away from the vineyards. The result is an exceptional terroir composed of flat rounded stones (“galets”) on clay limestone marls, enabling the vines to draw nutrients and moisture from the depth of the soil. Two winds adjust the climate. Southern breezes in August refresh the leaves and relieve the vines during the hottest days. The northern wind, the Mistral is a precious health bringing ally for environmentally-friendly vineyards. Cold and strong, it dries out the vines. Roussanne brings floral aromas and vigour while Grenache offers white, citrus and mineral notes. Marsanne gives vivacity and floral notes (bergamot and lime blossom) while Vermentino adds fresh, intense perfume (pineapple). Viognier provides aromatic strength and flavours of peach and apricot with Clairette adding freshness to the blends. Grenache provides fruitiness and roundness while Syrah adds colour and fineness. Mourvedre adds peppery notes, tannic structure and intense aromas. Carignan, a typical Mediterranean variety gives the wines fruity notes of cherries and added backbone. Marselan, newly introduced in the denomination (2008) brings tannins, colour and tangy red fruit (elderberry). Meticulous care and attention is paid to the vines. Soil and environment are treated with utmost respect. The northern wind, the Mistral is a precious, health-bringing ally for environmentally friendly vineyards. Very cold and strong, it dries the vines. After harvesting, the grapes are put in iron vats for the white and rose and concrete tanks for the red. The processing of the grapes is carried out according to each plot and to the tasting of each vat. The white and rose wines are vinified under strict temperature control. Ageing on the natural sediments of the grapes is achieved in vat. The vinification and ageing of the red wines proceeds in concrete tanks to enable the grapes to combine with oxygen. The fermentation and maceration of the grape vary from 8 days to one month according to the vineyard and wine variety. The malolactic fermentation of the red wines is followed by ageing on the lees. The variety of soils allows the different characteristics of the grapes to come to the fore at the blending process. Hand-picking is for the steepest slopes and mechanical harvest on the plateau. We sort bunches in the vineyards but it is rarely justified because of the homogeneity of the maturities. Before we fill up the tanks, the stem ofthe grapes is torn off and the berries are slightly pressed. The use of organic fertilizers, limiting treatments, encouraging vegetation (a mixture of grass and seeds) to prevent the erosion of the soil and favoring the ecosystems. Harvesting the grapes in the evening when the temperatures are lower reduces the refrigerating time. We use local suppliers, recycle of waste, and have reduced the weight of our bottles. Overall management, crop thinning, pruning and harvesting are all carried out by hand. “Royat double cordon” pruning method guarantees harmonious yields. The vines are systematically trained onto a trellis or “palissage”. As a result, the foliage ensures the full maturity of the grape. Debudding of the vine begins in May. In the early summer, the vines are thinned out to increase the amount of light and ventilation. Green harvest is carried out on some plots of young vines. 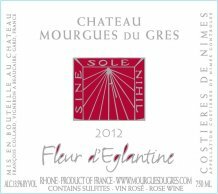 Fleur d’Eglantine owes its name to its color, which resembles that of the wild rose, perfectly reflecting its unique and delicate character. It is composed mainly of Mouvedre with smaller quantities of Grenache, Syrah and Carignan. Before this wine is aged in stainless steel vats, the Mouvèdre and Carignan are blended with the “saignée” method (bled-tank) with Grenache and Syrah. Color: Pale and delicate like a rose. Nose: Red fruits especially raspberry and red currant. Flavors: Elegant, ethereal floral notes of peony. It is crisp, light bodied, floral and dry with an excellent aromatic length. Best served chilled as an accompaniment to grilled fish, paella, curried mussels, or alternatively, sweet and savory Asian dishes. Enjoy now or within 12 months. Les Galets Rosés is named after a terroir deeply covered in “galet roils”, large flat sandstones that cover the soil and offer a mineral character of the wine and contributes to its balance. The stone’s pink, white, and red hues correspond to the color of the wines produced here. Traditional methods of winemaking are used: maceration of 15-21days. Maturation for about a year in concrete tanks to preserve its natural fruitiness. NOSE: Aromas of blackberries, licorice, and charcoal with a mineral touch. FLAVORS: Full-bodied, good acidity, freshness, and focus. There is a lovely red fruit bouquet with mild sweet spices. WINE & FOOD PAIRING: Perfectly matches meat dishes such as ducks or rib steak. Juicy, long and fresh it is also a worthy partner for wintery recipes based on potatoes, mushrooms and savory sauces. Best served at room temperature. Enjoy now and over 2-4 years. Derived from our young vines it is largely Grenache based with a compliment of Roussanne, Vermentino and Clairette. The northern exposure of this terroir provides a cooler environment for the vines and inflects the harsher extremes of the mediterranean summer. This northern site also lends a substantial vivacity to the wines which is guarded throughout its wine-making process by a rigorous temperature control preserving all of its natural fruit and freshness. COLOR: Light yellow with golden tints. FLAVORS: Citrus flavors mingled with floral aromas (orchid) with a mineral finish (charcoal). PALETE: Crisp, fresh and full, the perfect balance between fruit and smooth texture. WINE & FOOD PAIRING : With its bouquet of white blossoms and citrus fruits, the “Galets Dorés” makes for an excellent aperitif. A good companion to veal and poultry dishes and cheeses such as Cantal and goat-cheese. It is best served at 10 – 11°. “Les Galets Rouges” is predominately Syrah from younger vines with Grenache, Mourvèdre and old vine Carignan making up the final blend. Wine-making processes are traditional: after a maceration period of 8 – 15 days, the wine is matured for 7 to 12 months in epoxy lined concrete tanks in order to best preserve its natural fruitiness. FLAVORS: Ripe red fruits with a mineral touch. PALATE: A very harmonious and balanced wine with soft tannins, “Les Galets Rouges” is a sublime blend of spicy red and black berry fruits. WINE & FOOD PAIRING: It will perfectly match meat dishes such as duck or rib steak or game. Juicy, long and fresh it also matches perfectly with wintry recipes based on potatoes, mushrooms and savory sauces. Best served at 15°, this wine can be drunk now or within the next 3 years. 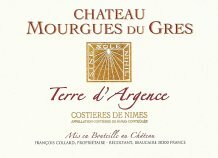 The name “Terre d’Argence” refers to a specific area within a larger terroir named “Argence” which is scattered with olive and alder trees whose leaves give a particular silvery hue in the strong Provencal daylight. Situated between the Rhone River and the Carmague, this terroir was once a part of the bishopric of Arles between XI and XIII centuries. 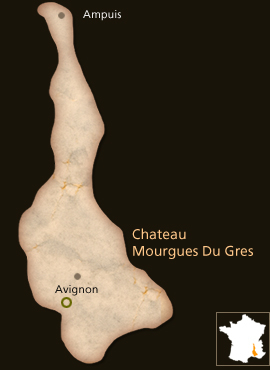 This white wine is labelled as a vin de pays du Gard and is composed of Roussanne, Viognier and Grenache white, all harvested at a maximum of 30 hectolitres par hectare. After traditional wine-making processes, the wine is aged in stainless steel tank for approximately 7 months. Brilliant golden color with green tints. WINE & FOOD: At best served decanted prior to serving, this wine marries well to dishes of poultry or pork with a sauce, scallops or fine cheeses at the end of a meal. 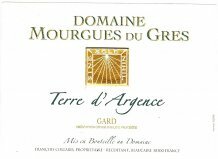 The name “Terre d’Argence” refers to a specific area within a larger terroir named “Argence” which is scattered with olive and alder trees whose leaves give a particular silvery hue in the strong Provencal daylight. Situated between the Rhone River and the Carmague, this terroir was once a part of the bishopric of Arles between XI and XIII centuries. This red wine is predominately Syrah based from vines that are over 45 years old and is complemented by old vine Grenache. A perfectly full southern exposure, with a subsoil of marl and calcareous limestone and a substantial surface layer of galet stones gives very privileged ripening conditions to these vines year in and year out. A traditional vinification, with a maceration period of 3 to 4 weeks, followed by a 9-12 month maturation period in concrete tanks leads to perfectly persevered fruit aromas with a depth of concentration that is an excellent example of the terroir of this wine. Limiting the harvest to 35 hectolitres per hectare preserves a remarkable depth of colour and retains a very tight structure. Very concentrated and complex, notes of black fruits and wild herbs of the garrigue underlie a delicate and fine mineral structure. With fine, soft tannins this wine extends a long, silky finish. At best carafed before serving, this wine can be appreciated immediately or will age elegantly for 5-7 years. The Terre d’Argence red best accompanies game meats or lamb with thyme or other Provencal herbs, red meats with sauce or strong cheeses. Built with time and patience, a “Capitelle” is an ancient stone shack in the vineyard where the winemaker keeps his tools and where he takes shelter when the weather is bad. Vestige of a millennial tradition, it is also a distinctive landmark in our terroir. The cut stone Capitelle standing in our vineyard has inspired us for this exceptional cuvee, since we want our wines to withstand the test of time just like the stone does. Carefully crafted and structured, we want it to be both smooth and sharp. Made with the exact same “Beaucaire” stone, our cellar shelters our barrels and allows our cuvee “Les Capitelles” to age gracefully in a cool environment. Mostly stemming from our oldest vines of Grenache blanc growing over a patch of limestone, this wine shows a very distinct minerality that ensures its recognizable finish. FOOD PAIRING: Perfect with poultry or veal, this wine’s minerality will create a great balance with rich sauce dishes, whereas its profuse aromas will pair very well with wild mushrooms or noble fish. 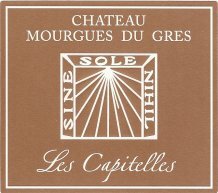 The “Capitelles des Mourgues” takes its name from a small stone shelter on the vineyard that was used to store tools and shelter vineyard workers during inclement weather. This predominately Syrah based wine is made from a strict selection of grapes, solely from a specific plot of old vines. With a more complex structure, enveloped by fine tannins and perfectly integrated oak aromas, this wine is a pure expression of fruit concentration and soft vanilla undertones. A touch of Grenache added to the final blend gives further complexity to a smooth, long finish that perfectly marries dishes of game meats and other meats prepared with a sauce. FLAVORS: Nose of blackberries, creme de cassis, licorice and spring flowers (violette). PALATE: The oak adds discreet hints of vanilla to this well-structured, heady wine marked by fruit and spices. It displays purity, full-bodied richness, good underlying freshness and vibrancy. WINE & FOOD PAIRING: Best decanted and served at with game room temperature, red meat, grilled or cooked in sauce, strong cheese.